- Annnnnnnnnd beadboard. Lots and lots of beadboard (Benjamin Moore Atrium White). 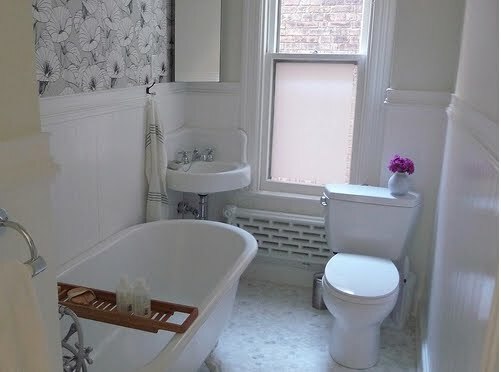 How do we visually pull this all together and have it look hip and modern and not like a cottage bathroom? I'd like to avoid 'a little bit country' and focus on 'a little bit rock and roll'. What should the light fixtures look like? The walls? What should we use for storage? So many questions. You got any ideas? Here are some images that thrill me. With beadboard being so central, it's really important that you do something "modern" and "rock and roll" that you are looking for on the top half of the wall - perhaps wallpaper or stencils with funky frames on top? Modern fixtures too will go a long way. Good luck! I love the sink you found for only 50$! I never have that kind of luck. I'm not a decorator but I love the funky green wallpaper in the last pic. I think you are doing a great job so far and I know you'll find some inspiration piece that will inspire the finished product. My first instinct is to say funky wallpaper. That first image is Ferm-living wall paper and it's one of my favourites. Because we don't spend THAT mucht ime in a bathroom, and because you'll already have a lot of white and grey surfaces, I think you can get away with something really funky and intense for the walls. I think your images depict exactly what you should do. Bold colour, bold pattern. It will bring it all together. Then do the light fixtures once everything is together... they are key to finishing off the look so I would wait until you have it in front of you. I love the pic with the dark paint and the vintage mirrors. I think if you stick with the dark, dramatic color, you will achieve the "rock & roll" look you're after. I can't tell if the paint in that pic is brown or a deep plum, but the plum would really work, I think. 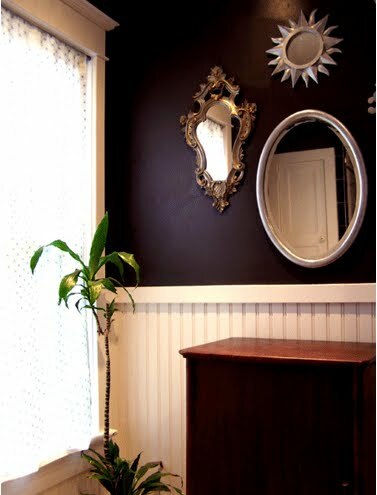 I love both the deep dark paint/mirrors pic and the funky lime paper look. Maybe a combination - a dark wild-ish print paper on the walls? I might steal the multi-mirror look for my new bathroom though! I'm such an un-inspired decorator I have to steal a lot of inspiration! I liked your "idea" photos. My personal favorite is the first one with the light gray and the patterned walls. Okay I'll stop. Haha I could go forever! Not sure what the cost is, but you can definitely find some cool ideas there. In Canada Home Depot actually has a really big array of wallpaper for not exorbitant prices, not sure if it's the same in the US. I love the dark walls, but that could be gloomy if your bath faces north so be careful. If it does face north, that apple green wallpaper is fab and you could get the same effect with paint. Throw in one other vibrant color via a piece of wall decor or a roman shade and it won't be country at all. So tough to choose one. I like the 1st, 2nd, and last ones. However like others have mentioned, lighting could be an issue with the dark walls. The first one I like, but it seems to cramped. however, the last one doesn't seem unique enough. Is some how you could mix all three. Of course- everyone else's advice seems better, because I am not an expert. Not sure if tile is definitely out but regardless, the grey is really nice and super neutral in a good way. If it was me, I'd stay away from bringing in much of any color other than some colorful towels. I think most wallpapers, etc, date so fast and all of your classic elements can speak for themselves without the assistance of crazy patterns! 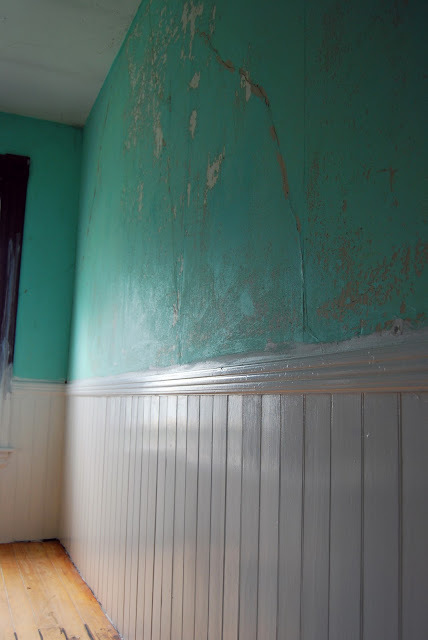 Just keep the wall above the beadboard white too or paint the wall a nice light complimentary grey/putty color that will work with the floor. Anyway, that's my rant! I guess I'm a bit biased to my selections, as I plan to do most of these elements in my own bathroom next year! I just think your set-up would look incredible in a classic industrial style such as this. Looking forward to seeing how you bring everything together. I like the wallpaper too. Either that or a dark contrast on top - maybe charcoal gray or black? I need to send you a picture of our classic black and white tile bathroom (unfortunately mostly cracked so in need of updating), but we have funky black and white wallpaper above it. A bit of a risk but it worked for us - except now 7 years later, it needs to be stripped and painted/papered again. Best part - walls don't have to be absolutely perfect. Oooh, I do love what you've done so far. I would go very modern on the light fixture and then a dark color on the walls. LOVE your inspiration pics! I like the modern wall paper in the Door 16 pics. There are so many gorgeous wall paper to chose from now. Modern fixtures would also look great. Can't wait to see the after. So exciting!! I was going to attach pics but it does not seem to be possible? We painted the room a light green (with small darker green "cubbies" inset into the wall for storage), the tub orange, and also picked up those colors on the skylight window-frames. We used rectangular frosted light fixtures. The floor is a mixture of white and light grey tiles. I'm really happy with it's modern funky clean look. 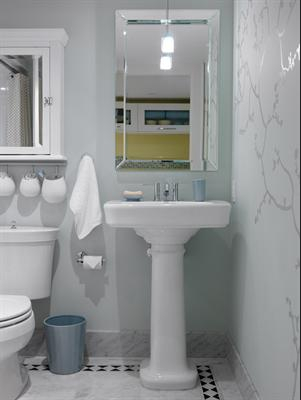 I would advise using some color that really pops, to contrast the white fixtures and grey floor. 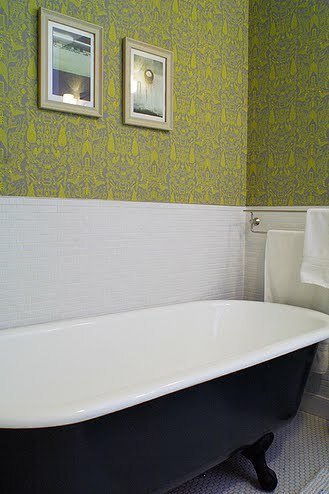 I love the yellow/green in the wallpaper above with the black tub!! Hey Alexis! I'd LOVE to see your renovation pics! Would you be willing to e-mail them to me at holyokehomeblog@gmail.com? I'm digging the mirrors. Definitely avoids country and heads into rock in roll. Ooooh, can't wait to see what choices win! 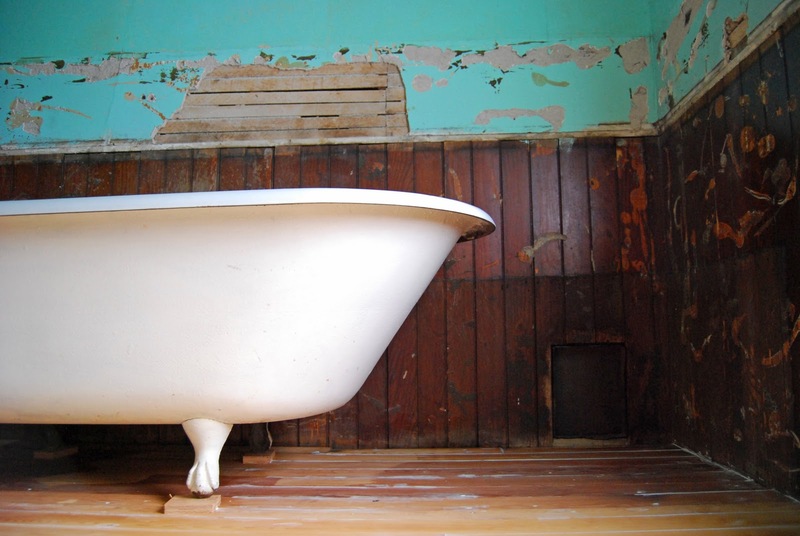 I'll be going through the same process for the not too cottage-y bathroom look. Possible Home for sale to feature. Row House on Linden Street went on the market yesterday for 40K. I definitely think the poppy wallpaper in some of the pictures you posted will give you the look you want. I especially love the black and white of the first one! Urban Outfitters actually has some decently priced, great patterned wallpaper on their website. wallpaper is a wall killer. don't use it unless you are going to burn the house down so no one ever has to take it down. no to wallpaper. I particularly like the juxtaposition of the old elements (bead board, hex tile, claw-foot tub) with the bright, fresh green wall color in your 2nd photo from Door 16. Keeping everything simple and bright and unfussy seems, to me, to be the easiest way keep it from looking too old fashioned and "country."